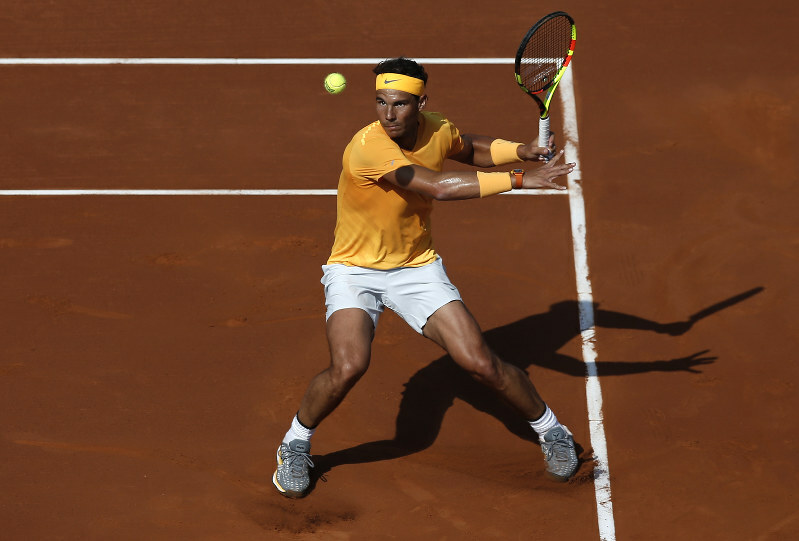 Rafael Nadal cruised into the Barcelona Open quarterfinals by defeating fellow Spaniard Guillermo Garcia-Lopez 6-1, 6-3 on Thursday. The top-ranked Nadal converted on his second match point to clinch his 16th straight victory on clay and set up an encounter with Martin Klizan, who eliminated Novak Djokovic in the second round, reports AP. "I came out with the conviction that I could play a lot better than I did yesterday (against Roberto Carballes Baena), and that's what happened," Nadal said. Coming off his 11th Monte Carlo title, Nadal has won 11 of his 12 ATP Tour matches this season, with the only loss coming from an injury retirement in the Australian Open quarterfinals. "I had more options in the second set but a player like Nadal doesn't give you many chances," the 69th-ranked Garcia-Lopez said. Klizan, the 140th-ranked Slovak who defeated Nadal in Beijing in 2014, reached the last eight by ousting veteran Feliciano Lopez 6-1, 6-4. Second-seeded Grigor Dimitrov of Bulgaria saved two match points to defeat Malek Jaziri of Tunisia 7-5, 3-6, 7-6 (8), while third-seeded Dominic Thiem of Austria got past Jozef Kovalik of Slovakia 7-6 (5), 6-2 for his 12th win in 15 clay-court matches this season. David Goffin of Belgium made it to the quarterfinals by coming from behind to defeat Karen Khachanov of Russia 2-6, 7-6 (2), 6-0, and 19-year-old Stefanos Tsitsipas of Greece upset local Albert Ramos-Vinolas 6-4, 7-5.